WIKIPEDIA: Enterprise architecture is a well-defined practice for conducting enterprise analysis, design, planning, and implementation, using a holistic approach at all times, for the successful development and execution of strategy. GARTNER: Enterprise architecture is the process of translating business vision and strategy into effective enterprise change by creating, communicating, and improving the key principles and models that describe the enterprise's future state and enable its evolution. FORRESTER: Enterprise architecture consists of the vision, principles and standards that guide the purchase and deployment of technology within an enterprise. THE OPEN GROUP: Enterprise architecture is a discipline that helps the enterprise define, develop and exploit the capabilities in order to achieve the enterprise’s strategic Intent. 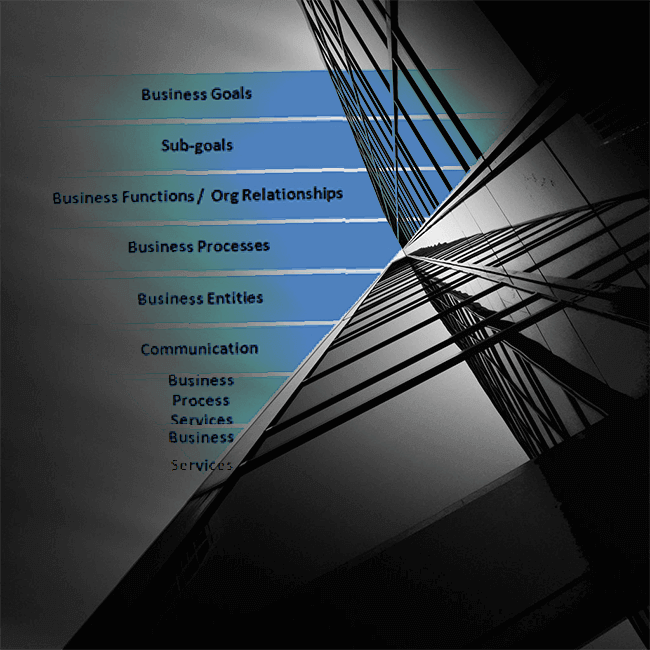 An ‘enterprise’ is any collection of organizations that has a common set of goals and/or a single bottom line. •	You start with your technology stack and link your way upwards (hence the term bottom up). Now there are also hybrid models in between, sometimes referred to a Middle-Out. An example would be that you start with you applications and describe those downwards to the technology layer and upwards towards the business layer and strategic layer. 1. Understanding the strategic drivers and what the technology needs behind those drivers are requires senior business management support. They need to be supportive of this. Does that support exist at the C-level? 2. The business strategies need to be clear enough that you can connect these downwards. Does the business strategy have enough depth & meat to it (fully recognizing that part of the EA is to add some depth and meat but there has to be some business direction described already)? Is there enough business strategy to build off? 1. Does the rest of the organization consider this linkage a problem? This kind of impact analysis is much more operationally focused and do those groups have a need for this? A ‘built and they will come’ doesn’t work! 2. When doing a bottom up approach maintaining the content & data is key. If the data is not always up to date the outcome can’t be trusted and the entire repository is not usable for this purpose anymore. So the question would be: how can we keep this data up to date? Now to also tie this back to enterprise architecture tools. For the top down approach, to ensure strategic alignment, it is important that the ea tool can produce business friendly outputs. Especially diagrams showing business models and capabilities maps MUST be business friendly and not too technical. On the bottom up approach, used for more operational impact analysis, the enterprise architecture tool must have the ability to generate matrices and catalogs or even specialized impact analysis reports. Also it must be easy in the tool to update data. Now I did hint towards a third option of Middle Out but will keep this for my next post, next week. Manage your architecture portfolio, your enterprise architecture building blocks. Applications, platforms, data but also any business components. A complete EA solution for all enterprise architecture activities with 80+ real-life templates ready for use. Includes an advanced EA modeling feature to create professional, business friendly enterprise architecture models and diagrams, ready for presentations. Apply architecture governance to ensure that projects are aligned with standards, reference architectures & technology strategies.